This map shows the electoral outcome of the 2016 US Presidential Election and is color coded red if the state was won by Donald Trump (R) and blue if the state was won by Hilary Clinton. When looking at the map, red states tend to be larger in area than blue states, but also generally have lower populations. This gives a misleading impression that the electoral share is “redder” than it actually is. 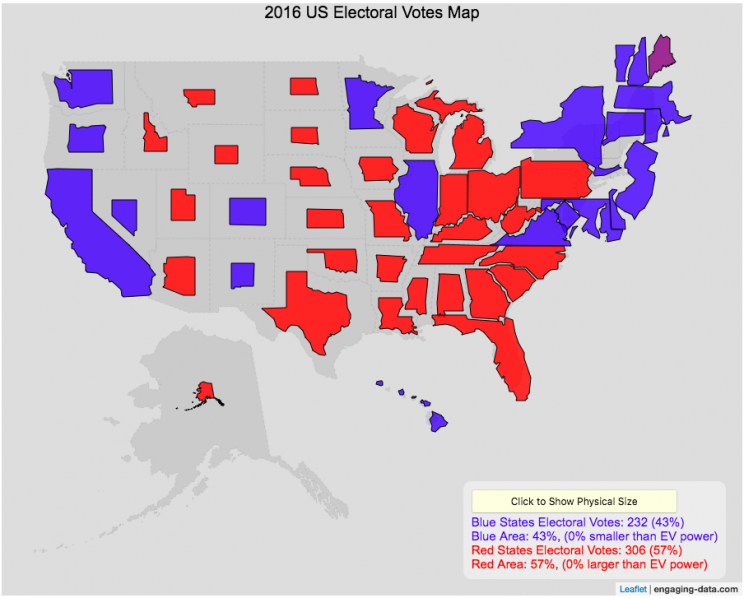 For 2016, we can see that Trump won 306 electoral votes or (57% of the total electoral votes), but the map is shaded such that 73% of the area of the US is colored red. Similarly, Clinton won 232 electoral votes, but the map is shaded such that only 27% of the map is colored blue. The map shrinks the states with low electoral votes relative to its area and increases the size of states with large numbers of electoral votes relative to its area. On average blue states grow as they are under-represented visually, while red states tend to shrink quite a bit because they are over-represented visually. Alaska is the state that shrinks the most and DC and New Jersey are the areas that grow the most in the new map. I think this gives a more accurate picture of how the states voted because it also gives a sense of the relative weight of those states votes. Even with the change in sizes, the map is still mostly red, but gives a better sense of how close the electoral vote totals are. If you need to register to vote, please visit Rock the Vote to get registered in your state. US politics has more than a few issues, which have been highlighted by the current situation in Washington DC. The protests and greater political awareness from high school students and young adults is a positive sign for democracy, but it needs to be accompanied by increased rates of voting from this demographic. I thought it would be interesting to explore rates of voting in the US across different demographic groups (age, education, income, race). This data is from the 2016 US presidential election. Total eligible US voting population was about 224 million in 2016 and the overall rate of voting among this population was 61.4%. The first graph shows the distribution by age. As we can see, the rate of registration and voting increases with age. It is hard to engage young people to be interested in voting but hopefully they will do so in greater numbers this upcoming election.